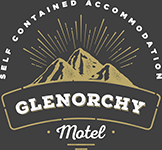 Glenorchy Motel makes a great base for those wanting to explore what the area has to offer, and although there are many adventure activities, it is the stunning natural scenery and great outdoors aspect that has made Glenorchy famous, and keeps visitors coming back year after year. 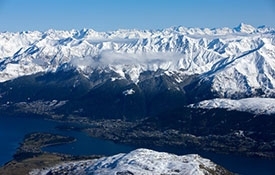 Glenorchy is the gateway to Mt Aspiring National Park and several famous back country walking tracks including the Routeburn, Caples, Greenstone and Rees-Dart, as well as many popular local day walks. The Whakaari Conservation Area has opened up a whole new area close to Glenorchy, rich in history and accessible by horseback, mountain bike and on foot. 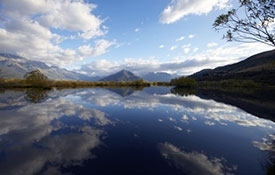 Glenorchy is only a 1-hour scenic drive from Queenstown Airport. You have to travel through Queenstown to reach Glenorchy, which will give you an excellent opportunity to look round the shops and restaurants in the centre, or take a trip out to the gold rush town of Arrowtown. 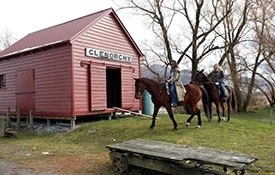 Glenorchy Information Centre is located in the main street, Mull Street, as part of the historic Glenorchy Hotel. The Glenorchy General Store is also located here, where you can purchase packed lunches, camping supplies, gifts, postcards, etc. Your hosts, Kath and Trevor Cruickshank, have been in the area since 1999 and take great pleasure in helping you to make the most of your stay. Besides the many walking tracks there are a lot of other activities to enjoy in the area. You can try your hand at fishing for trout and salmon in the rivers and the lake. Jet boat the amazing Dart River, or enjoy a fun yakking trip. There are also guided kayak trips, horse trekking, 4WD adventures or sky diving to name a few. Surrounded by majestic mountains and set on the shores of crystal clear Lake Wakatipu, the natural beauty and the unique energy of Queenstown creates the perfect backdrop for a holiday full of adventure, exploration or relaxation. 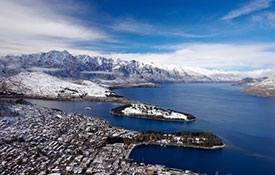 Queenstown is only a 45-min drive from Glenorchy. A good zigzag track climbs three quarters of the way up Mt Alfred and from there you'll follow a marked route to the bushline. There is no public access beyond the bush line. 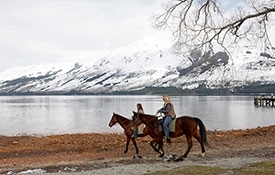 Internationally recognised for its exceptional beauty and natural, untouched qualities, Glenorchy has been showcased in the Oscar winning Lord of the Rings trilogy as well as other big screen movies (see The Ride of the Rings), and is home to Dart Stables. If you're into fly fishing, spinning, trolling or drift fishing Queenstown Fishing has the means and the know how to get you onto the fish! 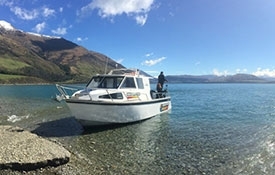 Queenstown Fishing offers one of a kind boat and fishing charters or guided fly fishing experiences on the spectacular alpine lakes Wakatipu, Wanaka and Hawea plus the world renowned rivers of the Southern Lakes region.